John Joseph Daly, Adelaide barrister and solicitor, was Leader of the Government in the Senate during the first fourteen months of the Scullin Government. On the floor of the Senate he was ‘a man of outstanding merit’, but, as a Cabinet minister, he was a man in a quandary, caught between the conflicting forces swirling around J. H. Scullin and J. T. Lang, and the power struggle between the federal and South Australian Labor Parties. John Joseph and his twin brother, Mathias, were born on 10 November 1891 to Margaret Daly, née Hayes, and her husband John Daly, a carpenter of Hemington—now part of the Adelaide suburb of Clarence Gardens. John attended St John the Baptist School, Thebarton, leaving at thirteen to work as a rouseabout and paper seller while he studied for his matriculation certificate at night school. Soon he joined the Adelaide law firm of Josiah Symon as an office boy, then clerk. Close to his father, a foundation member of the South Australian Amalgamated Society of Carpenters and Joiners, John was fourteen when he joined the Australian Workers’ Union. He was also a footballer, later managing a South Australian interstate team. In 1912 Daly became conveyance clerk in the law firm of W. J. Denny, who from 1910 to 1912 was Attorney-General in the South Australian Labor Government of John Verran. In 1918 Daly qualified for Adelaide University’s final certificate in law and was admitted to the South Australian Bar. In 1919 he set up as a solicitor and by the 1920s he and Denny were in partnership, Daly specialising in criminal and, particularly, industrial law. (At various times the firm included other partners.) On 16 October 1918 at St Francis Xavier’s Cathedral, Adelaide, Daly married Eva Bird, the daughter of Charles Henry Bird of Kadina. From his early twenties Daly was inclined towards politics. He joined the South Australian Literary Society’s Union Parliament, rising to be ‘Premier’ of a ‘Labor ministry’. In 1916 he was secretary of the Self-Determination for Ireland League and from 1925 to 1928 national president of the Hibernian Australasian Catholic Benefit Society. He joined the Australian Natives’ Association, became a Justice of the Peace, and was a member of Adelaide’s Democratic Club. In 1918 he supported the Adelaide tramways strike and was made an honorary member of the Australian Tramways Union, though his service to unionism lay primarily in his ability to act as an advocate for the labour cause in industrial cases. From 1919 to 1928 Daly was a member of the executive of the South Australian Labor Party, serving as president in 1927, and from 1924 to 1928 he was a member of the ALP’s Federal Executive. He was a delegate to Commonwealth Political Labor conferences in Melbourne (1924) and Canberra (1927 and 1930). Daly made two unsuccessful bids for Parliament—in 1924 for the South Australian Legislative Council (Central No. 2) and in 1925 for the Senate. In 1928 he tried again for the Senate, and at the federal poll in November was elected, defeating John Verran, now a Nationalist. Verran had been the incumbent of a casual vacancy vice Labor’s Senator McHugh. 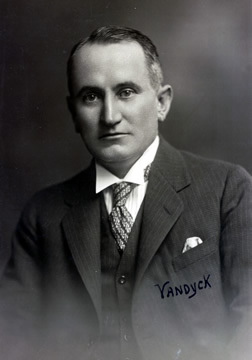 Under federal electoral law, Daly filled the remaining seven months of the casual vacancy, starting on 17 November 1928, before beginning his six-year term. A man of slight stature with clean-cut features, and a somewhat sad, even bewildered, expression, he was a fluent speaker, lucid and courteous, knowledgeable but not patronising, and with an eye for detail. The authority of Parliament over the executive was a tenet of his political philosophy. His first speech was on 20 February 1929, when he opposed a provision of the Bruce–Page Government’s Commonwealth Employees’ Compensation Bill, which vested the control of workers’ compensation with a government-appointed commissioner. By March he was deputy to the Leader of the Opposition in the Senate, ‘Ted’ Needham. When Needham’s term expired at the end of June Daly became leader. In September he led for the Opposition against the Government’s Arbitration (Public Service) Bill, which provided for the transfer of industrial law to the states. Nothing came of the legislation though it contributed to the defeat of the Government at the October election. On 22 October the Labor Caucus elected Daly to the Cabinet as Vice-President of the Executive Council and Leader of the Government in the Senate. As one of only two ministers in the Senate, he also represented five portfolios held by ministers sitting in the House of Representatives, and was responsible for the Council for Scientific and Industrial Research and for the Development and Migration Commission. As Leader of the Government, Daly had a heavy workload. Behind him sat the Deputy Leader of the Government in the Senate, Senator Barnes, and Senators O’Halloran and Hoare, and Dooley, Dunn and Rae—an unlikely number to expedite Labor’s long-hoped for legislative reform. Opposition senators were not reassured and despatched the ‘egg’ to a Senate select committee, on which Government senators refused to serve. C. B. Schedvin, in his Australia and the Great Depression, quotes a statement by the banker, A. C. Davidson, who claimed that it was the Sydney bankers who had ‘arranged’ that senators should send the bill to a select committee. Doubtless suspicious of the Opposition’s connections with the banking world, Scullin (reputedly) cut off funds to the committee. Unfazed, the Opposition senators (again reputedly) funded the inquiry out of their own pockets, calling on influential witnesses sympathetic to their views, and so managing to shelve the bill until December, after which it joined what Geoffrey Sawer has described as the Scullin Government’s ‘slaughtered innocents’. One innocent, however, escaped absolute slaughter. This was the Conciliation and Arbitration Bill introduced in July 1930, which was central to Labor’s reform of industrial legislation, and which proposed to repeal the penal provisions of the Bruce–Page Government, and establish judicially empowered conciliation commissioners. As this bill was of greater importance to Labor than the banking bill, Daly confessed it was of ‘some satisfaction to the Government to know that, at least, its child is permitted to be born’, though he rightly anticipated trouble at the committee stage. When the bill stalled for the second time in the Senate, the Government, as anxious as the Opposition to avoid a simultaneous dissolution, called for a conference between the two houses. Daly, a ‘clever’ negotiator, according to the Leader of the Opposition, George Pearce, was one of the eight senators and members who, meeting in the early hours of 8 August, negotiated a position that enabled a watered-down version of the bill to pass. As the Senate rose for the winter recess Daly could not have realised that the previous months would prove to be the most successful part of his parliamentary career. On the left of his Party—and of the Prime Minister—Daly was opposed to reductions in government expenditure and to the policies of the bankers, notably the Governor of the Commonwealth Bank, Sir Robert Gibson, and the visiting British financier, Sir Otto Niemeyer. But unlike his close Cabinet associates, Frank Anstey and Jack Beasley (the latter would join the Lang Labor group), Daly was conciliatory, preferring absence, or silence, to a fight, and at times he was unwell. In August, he was not present at the Cabinet meeting at which Gibson was reappointed Governor, and does not seem to have made his opposition to the expenditure reductions (agreed to at the Melbourne conference of premiers and treasurers in August) clear to the Prime Minister. Even the press found Daly’s position ‘obscure’. As Scullin embarked for London on 25 August (with Minister Parker Moloney) he left behind a country in the depths of an unprecedented Depression, a confused and angry union movement and a Cabinet of largely inexperienced ministers. Of these, Daly was Acting Attorney-General vice Frank Brennan, who was in Geneva. Also absent was the Treasurer, Theodore, who had resigned from Cabinet in July over his Queensland mining interests. Daly must have been well thought of, for he had been considered as a stopgap for the position of acting Prime Minister; his association with Anstey and Beasley probably went against him, Scullin appointing the right-wingers, J. E. Fenton and Joseph Lyons, to act as Prime Minister and Treasurer respectively. Within a few days of the Prime Minister’s departure, Daly aligned himself with Barnes, Anstey and Beasley in denouncing wage reduction and uniting against Lyons and Fenton in opposing the recall of Parliament to implement the Melbourne agreement. The press reported the Cabinet split. Searching for an economic solution acceptable to the whole, Daly joined Fenton and Lyons in a Cabinet subcommittee. The subcommittee was doomed to failure, Daly’s public comments opposing wage cuts hardly helping, though by the end of September Cabinet was considering a compromise plan—the reduction of parliamentary and public service salaries, and new taxes for all incomes but those ‘derived from personal exertion’. As Daly and his Cabinet colleagues were considering the recall of Parliament to implement their plan, J. T. Lang, then New South Wales Leader of the Opposition, descended upon Canberra. He attended a Cabinet meeting at which he made sure that the Parliament would not meet again until after the New South Wales election at the end of the month. Daly then accompanied Lang on the latter’s campaign trail to nearby Queanbeyan, where he appeared on Lang’s election platform. A little later, in Sydney, Daly spoke at Lang’s political rallies at the Domain and the Grand Opera House though at no time did he indulge in the anti-Niemeyer sensationalism of Anstey and Beasley, and never spoke publicly against the absentee Prime Minister. With the New South Wales election safely over, federal Parliament finally met at the end of October. At a meeting on 27 October, Caucus agreed on a policy of modest credit expansion, which Barnes supported, while Daly moved, unsuccessfully, for an adjournment of the debate. As Acting Attorney-General, Daly made some questionable ministerial decisions, as when he judged the Seamen’s Union official, Jacob Johnson, to have been wronged, when it seems no injustice had been done. Of greater consequence was his appointment of H. V. Evatt and E. A. McTiernan, MHR, both Labor, to the High Court in December 1930. Daly knew this to be contrary to the wishes of Scullin and Brennan, who were sensitive to charges of making political appointments, and who were in any case homeward bound. Furthermore, a motion to fill the vacancies had been withdrawn in Caucus on 27 October. Scullin arrived back early in 1931 and on 2 March, in a ministerial spill, Daly was dropped from the Cabinet at a Caucus meeting at which he was not present, Barnes taking his place. In the Senate there were none of the usual announcements regarding the appointments, though in answer to a question, Barnes explained that as a result of heavy parliamentary and ministerial duties, Daly had suffered a complete breakdown. The defeat of Senator Daly removes from the Cabinet one of its ablest Ministers, who had shown outstanding ability, particularly on the floor of the Senate. His defeat was not altogether a surprise, however, for he had recently lost favour among his colleagues because of his failure to ally himself definitely with any particular faction of the Labour party. Schedvin suggests that the immediate reason concerned the reinstatement of Theodore as Treasurer on 26 January 1931 and the subsequent ‘Theodore Plan’ of credit expansion, which Caucus had approved as the Fiduciary Notes Bill at the 2 March meeting. To have any hope of getting this legislation through the Parliament Scullin required full Cabinet support, which Daly could not be relied upon to give. By April he was serving on the Public Works Committee and was back in Caucus, moving that the Sugar Agreement be ratified by the Parliament, not the executive. He remained silent during the debate on the Fidicuary Notes Bill, which in the event was defeated in the Senate on 17 April, leaving the way open for another modification of the Government’s economic policies—the Premiers’ Plan, which he supported. By 25 June Daly had been reappointed to Cabinet as Assistant Minister for Development. He also represented the Prime Minister in the Department of Industry. In August he became chairman of the Premiers’ Conference Secretariat, and in charge of its Unemployment Secretariat, though when the bills implementing the Premiers’ Plan came before the Senate, he did not contribute to the debate. His reticence did not save him from the ire of the pro-Lang South Australian Labor Party, which in August 1931 expelled him, along with his friend, Senator O’Halloran, though the Federal Executive later reinstated the two senators. Daly was now the victim of the struggle for ascendancy between the federal and South Australian arms of the Labor Party. Nevertheless, he retained his ministerial positions until the Scullin Government was forced to an election in December, after which he spoke seldom, being present in the Senate on only 44 out of 115 sitting days, his only parliamentary appointment being that of the ‘domestic’ House Committee in 1932. Doubtless disillusioned with the internecine politics of the South Australian Labor Party, in 1933 he spoke in support of a non-Labor candidate for the South Australian election. Again South Australian Labor expelled him, though federal Labor largely ignored the matter. In August 1934 he was not preselected for the 1935 federal election. In his final speech in the Senate Daly spoke wistfully of returning again, but he never did. Periodically unwell throughout this miserable period in Australian politics, he died at Calvary Private Hospital, North Adelaide, on 13 April 1942, survived by his wife and five children, Margaret, Kevin, Mary, Laurence and Josephine, the family having lived at 20 Wainhouse Street, Torrensville, for many years. A Requiem Mass was celebrated in the Queen of Angels’ Church at Thebarton before Daly’s burial in the Catholic cemetery at West Terrace. The journalist Warren Denning thought Daly ‘as loyal as most at a time when divided loyalties made so many claims’. Warren Denning, Caucus Crisis: The Rise and Fall of the Scullin Government, Hale & Iremonger, Sydney, 1982, p. 75; Heather Radi and Peter Spearritt (eds), Jack Lang, Hale & Iremonger & Labour History, Neutral Bay, NSW, 1977, p. 30; Ray Broomhill, ‘Daly, John Joseph’, ADB, vol. 8; Labor’s Thirty Years’ Record in South Australia 1893–1923, Daily Herald, Adelaide, SA, , pp. 62, 71; Information from Helen Bruce, Records & Archives Services, University of Adelaide; Australian Worker (Syd. ), 21 Aug. 1929, p. 6, 27 Nov. 1929, p. 7, 15 Apr. 1942, p. 5; SMH, 14 April 1942, p. 6; Don Hopgood, ‘The View from Head Office: The South Australian Labor Political Machine, 1917–1930’, Politics, May 1971, pp. 70–8. SMH, 14 Apr. 1942, p. 6; CPD, 4 May 1932, pp. 314–15, 20 Feb. 1929, p. 359, 4 Sept. 1929, pp. 476–8. CPD, 26 Mar. 1930, p. 461. CPD, 27 June 1930, pp. 3436–43; C. B. Schedvin, Australian and the Great Depression, SUP, Sydney, 1970, pp. 175–6; CPD, 11 July 1930, pp. 4063–4; L. F. Crisp, Australian National Government, Longman Cheshire, Melbourne, 1965, p. 340. CPD, 24 July 1930, pp. 4600–4, 7 Aug. 1930, pp. 5528–9, 5535, 5636, 7 & 8 Aug. 1930, p. 5582, 8 Aug. p. 5664. John Robertson, J. H. Scullin: A Political Biography, UWA Press, Nedlands, WA, 1974, pp. 258–9, 266–7; CT, 3 Sept. 1930, p. 1; Robertson, J. H. Scullin, p. 268; L. F. Crisp, Ben Chifley: A Biography, Longmans, Green & Co., Croydon, Vic., , p. 42; CT, 4 Sept. 1930, p. 1, 5 Sept. 1930, p. 1; Schedvin, Australia and the Great Depression, pp. 189–90; Robertson, J. H. Scullin, p. 272; Irwin Young, Theodore: His Life and Times, Alpha Books, Sydney, 1971, p. 128; SMH, 1 Oct. l930, p. 13. SMH, 2 Oct. 1930, p. 9, 3 Oct. 1930, p. 11; Bede Nairn, The ‘Big Fella’: Jack Lang and the Australian Labor Party 1891–1949, MUP, Carlton, Vic., 1995, pp. 206–7; SMH, 20 Oct. 1930, p. 12, 22 Oct, 1930, p. 14, 24 Oct. 1930, p. 12; Patrick Weller (ed. ), Caucus Minutes 1901–1949, vol. 2, MUP, Carlton, Vic., 1975, pp. 389–95, 410–12. Robertson, J. H. Scullin, p. 356; Weller, Caucus Minutes 1901–1949, vol. 2, p. 425; SMH, 24 Dec. 1930, p. 8; Argus (Melb. ), 19 Dec. 1930, p. 9; Robertson, J. H. Scullin, p. 283; Weller, Caucus Minutes 1901–1949, vol. 2, p. 395; CPD, 19 Mar. 1931, p. 372; Robertson, J. H. Scullin, p. 314; SMH, 3 Feb. 1931, p. 9, 5 Feb. 1931, p. 8, 3 Mar. 1931, p. 9; Schedvin, Australia and the Great Depression, pp. 239–40; Weller, Caucus Minutes 1901–1949, vol. 2, pp. 421–4, 431–2; CPD, 24 Feb. 1932, pp. 196–7. SMH, 26 June 1931, p. 11, 14 Aug. 1931, p. 9; Patrick Weller (ed. ), Caucus Minutes 1901–1949, vol. 3, MUP, Carlton, Vic., 1975, p. 62; Patrick Weller and Beverley Lloyd (eds), Federal Executive Minutes 1915–1955, MUP, Carlton, Vic., 1978, p. 168; SMH, 14 Apr. 1933, p. 6, 14 Aug. 1934, p. 15; CPD, 10 Apr. 1935, p. 1191; Advertiser (Adel. ), 14 April 1942, p. 4; Denning, Caucus Crisis, p. 104. This biography was first published in The Biographical Dictionary of the Australian Senate, vol. 2, 1929-1962, Melbourne University Press, Carlton, Vic., 2004, pp. 254-259.